Texas Tales: Edinburgh, Take 2! It's a quiet Friday morning, I'm sipping off a mug of hot tea in bed while enjoying the beautiful rays of sunshine working their way around the curtains of my window. Oh, and I'm listening to "The Weary Kind," which is the theme song for the movie Crazy Heart (with Jeff Bridges). I'm not sure about the rest of the soundtrack, but for some reason this one really appeals to me. Which brings me to the point of this entry: our Edinburgh trip! It's been nearly a week since we took our friends from Houston and hopped on the train to the capital city, and we had a fantastic time. It was really good that we took another trip, for Mike and I, since our first visit during Hogmanay (New Years) was bitter cold, rainy and all at night. It's like a whole new place seeing something in the daylight! After a pit stop for a couple drinks and some lunch (my baked potato with bacon and brie was soooo good, never would've thought of that combination! ), we headed out to see the sites. And see the sites we did. We had made it off the train in time to hear the cannon sound from the castle at 1pm, and after lunch we made a beeline for the mammoth structure to get a look inside. It's an absolutely gorgeous castle, with lots of painstakingly restored areas to preserve its authenticity. 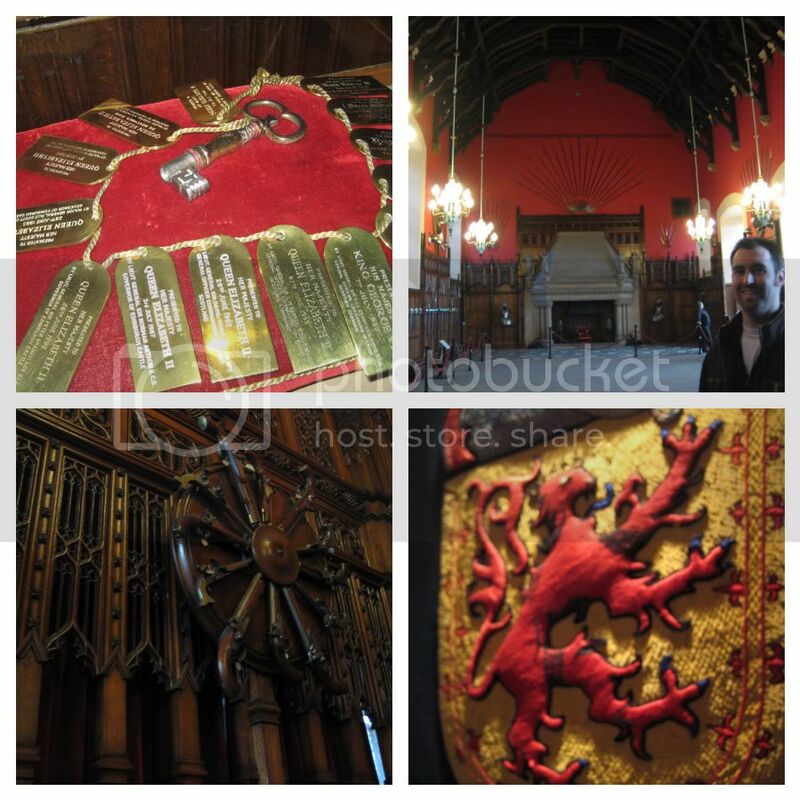 We saw the Scottish National War Memorial - which also held the their tomb of the unknown soldiers - the Great Hall, the chamber where Mary Queen of Scots gave birth to her son who later became King of England, and (drum roll... and more parentheses) the Scottish Crown Jewels. What a majestic site. After we were done ooh-ing and aah-ing over those, we spent a couple minutes perusing the grounds until we noticed Dominick and Brittany looking quite romantic just outside the castle's chapel. As soon as Brittany looked at her hand, I knew he'd popped the question and she said yes!! They were so adorable and I think Brittany was truly in shock, she said she'd had no idea it was coming. 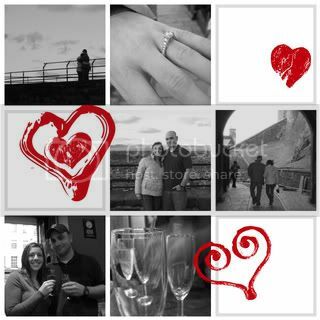 And what a wonderful engagement story, being proposed to in the castle chapel - the oldest building in Edinburgh - followed by pictures atop the spired capital city of Scotland. Of course, that called for some Champagne, so we made our way to the nearest bar where we could find a seat and popped the top! The rest of our night was spent doing a little pub hopping around, and unfortunately, we had to spend nearly an hour and a half trying to wave down a taxi to get back to our hotel. If they don't feel like pulling over for ya, it's not going to happen. And several places in the city have "taxi stops" so you have to wait in the longest line in hopes of actually catching a cab before they just stopped coming by completely. We ended up in one such line and a couple of drunks, too-small cabs and impatient sighs later, we were on our way. The next morning, we squeezed in a visit to the National Museum of Scotland (free admission) and got to see some unique pieces of history like an old ledger containing Certified Tartans of the Highland Society of London from the 1800s; old bank notes dating all the way back to 1764; a calculator from 1698; and a Scottish international football cap and jersey issued in 1907. Afterwards, it was a quick pint at Frankenstein's pub and a skip and a jump over to the train station for one of the most fun train rides ever. Like ever ever. We'd taken a cue from the train riders on our way up, who were all stoked for the rugby game and had taken the liberty of bringing tons of adult beverages and snacks with them for the journey. So, likeminded, we scooped up a couple bottles of wine, some Walkers shortbread cookies, cheese, crackers, pistachios, meats and piled onto the train. Our group of 6 shared one of our two tables with a fellow couple from the Aberdeen area who'd come in town for the game. They were nice enough and got even nicer when, after we'd told them about Dom and Brittany's engagement, pulled out two bottles of Champagne! It was his birthday as well, so we dubbed one bottle the celebratory engagement bottle and the other one for his birthday. His name was Sean, but we weren't totally sure until we sang him happy birthday... when we got to the "deeeeeeaarrrr INSERT NAME HERE," uh, well we didn't all know his name. Which only erupted into yet another fit of hilarious laughter. I think he appreciated the sentiment nonetheless. When we got back to the flat, we had our own little beer tasting (found the beer we liked in Prague, Krusovice, at Peckham's! Last parentheses I swear.) and ordered some Chinese food. It was the perfect ending to a great day. Congrats to Dominick & Brittany! I enjoyed showing Grandma this post on Facebook....but I like reading it so much BETTER here on the original blog!! Great time y'all had...as always!! What FUN!